Satisfy your inner culture vulture at Sea Fortress Suomenlinna and Rock Church. 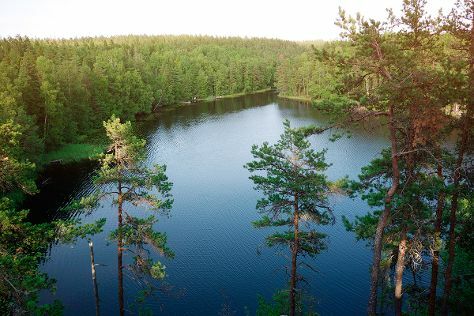 Take a break from the city and head to Nuuksio National Park and King's Road. Change things up with a short trip to Teijo national park in Pernio (about 1h 50 min away). Next up on the itinerary: hunt for treasures at Market Square Kauppatori, buy something for everyone on your list at Kamppi Shopping Centre, stop by Artisaani, and pause for some serene contemplation at Helsinki Cathedral. To see other places to visit, ratings, more things to do, and other tourist information, you can read our Helsinki journey planner. If you are flying in from United Kingdom, the closest major airport is Helsinki Vantaa Airport. In May, daily temperatures in Helsinki can reach 18°C, while at night they dip to 7°C. Wrap up your sightseeing on the 14th (Tue) to allow time to travel back home.